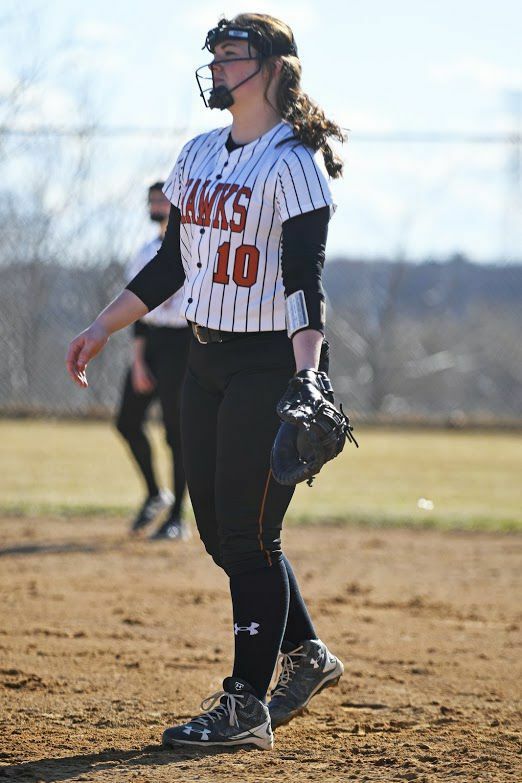 Bloomer softball player Isabella Jenneman returns to the Blackhawks softball team this season after tearing her ACL. View more photos at LeaderTelegramPhotos.com. Bloomer's Isabella Jenneman stands vigilant at first base during a softball game at Eau Claire North on April 8. Bloomer's Isabella Jenneman swings during a softball game at Eau Claire North on April 8. Bloomer’s Isabella Jenneman looks for a shot while Regis’ Teryn Karlstad defends on Thursday, Feb. 14, in Eau Claire. Looking on, Isabella’s mother, Becky, said she could feel her daughter’s pain. Twenty-five years earlier, she went down grabbing her knee in a high school basketball game, and now, she watched as her daughter lay on the ground, crying as her knee quickly began to swell up. Her coach, Keith Poirier, came out of the dugout to check on his star slugger. Her father, Brady Jenneman, said the moment was “heart sinking.” He watched as his daughter tried to hobble back to her base. Not realizing the severity of what had just transpired, Isabella bandaged up her knee and decided to bare through the pain for the rest of the inning. Between innings, it became too much and she decided she needed to come out. “She said she felt like her leg was in two pieces,” Becky Jenneman said. After the game, a 9-3 victory over Cumberland on May 8, 2018, the Jennemans decided they needed to take their daughter to the hospital. X-rays on her knee came back negative, but doctors wanted to run some more tests. There, Isabella’s fears were confirmed. Just like her mother 25 years prior, Isabella tore through her ACL. ACL tears are one of sports most dreaded injuries. Typically rehab takes about a year before athletes are back to normal. The doctors told her she would need at least eight months to get back to sports. “Her biggest fear was that she wasn’t going to be able to play sports again,” Becky said. So, Isabella got to work rehabbing. Once she was back on her feet, the therapy really got started. She was determined to get back for the start of basketball season, two months before her original eight-month timetable. “She had it in her mind that she was not going to miss basketball or softball this year,” Becky said. On November 20, Isabella proved the doctors wrong and walked out onto the court at Elk Mound for Bloomer’s season season opener. Again, her father watched nervously as his daughter ran up and down the court. He said it was a physical game and Isabella was playing tough in the post. And then, she lost her footing and fell to the ground. “My heart jumped out of my chest,” Brady said. For a moment, it looked like Isabella had come back too quickly. But, she rose back up, shook out her knee, and finished the game unscathed, leading the Blackhawks to a 41-30 victory over Elk Mound with a team-high 10 points. After a successful basketball season, Isabella turned her attention to softball as the Blackhawks took a trip down to Florida to get in some preseason games in late March. She went 0 for 3 with a walk and three strikeouts in the first game, a 6-5 loss to Dublin Jerome. After the game she called home and spoke to her mother who encouraged her to put her brace back on to help get over the mental hurtle of stepping back out onto the field. She didn’t listen. Once again, she took the diamond without the brace. This time though, the results were different. She started the game 1 for 3 with a run and a walk. Tied 8-8 in the bottom of the ninth against La Crosse Aquinas, her four-spot came up in the order. With Rylee Luzinski looking in from second, Isabella rocked a walk-off double to take the 9-8 victory. The hit was vintage Isabella. Last season, she hit four home runs and had 25 RBIs before the injury. This year, she’s expected to be the Blackhawks’ slugger and once again hit fourth and play first. Now, 11 months after she fell to the ground grabbing her knee, Jenneman says she is ready for one last season and a chance to lead the Blackhawks to a conference title and a trip to Madison.